Delicious Soundbites is a group of four women who sing acapella (no instrumental accompaniment). 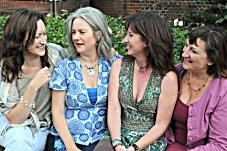 Janet Ayers, Kelly Briant, Fiona Moore Funnell and Sandra Thibault have been weaving their harmonies together for years. They’ve released an album, ‘Fabulous Turquoise Coat‘ with all the songs written and arranged by band leader and composer Fiona Moore Funnell. Original compositions from jazz to salsa, folk to pop!